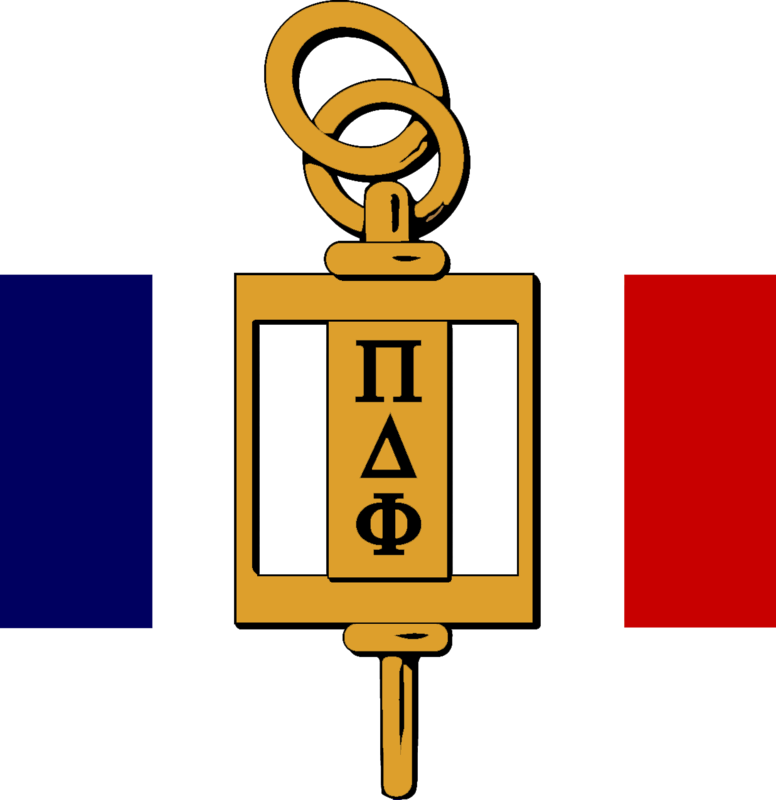 Pi Delta Phi is the National French Honor Society for undergraduate and graduate students at accredited public and private colleges and universities in the United States. Founded in 1906 at the University of California at Berkeley, Pi Delta Phi is the oldest academic honor society for a modern foreign language in the United States. There are currently more than 75,000 members and 380 chapters of the Society in the United States and two representative chapters in France. The society was admitted to membership in the Association of College Honor Societies (ACHS) in 1967. The Society's purpose is to recognize outstanding scholarship in the French language and its literatures, to increase the knowledge and appreciation of Americans for the cultural contributions of the French-speaking world, and to stimulate and to encourage French and francophone cultural activities. The qualification to establish a chapter are: a major or minor in French or French studies—or related major or minor in Romance or Modern Foreign Languages, Global or International Studies, etc.—that requires students to complete a minimum of two advanced-level courses taught in French (beyond the intermediate series of classes). 3.0 GPA in French, 3.0 GPA overall, and rank in the top 35% of their class; contact the President if class rank is not used. Honorary members include: the French faculty of the sponsoring institution who are not already members of Pi Delta Phi; members of the faculty at large who are not already members of the Society; undergraduate and graduate students who do not meet the above requirements for regular membership; college or university alumni who did not become members while attending the sponsoring institution; and diplomats, community and business leaders, and others who have demonstrated their support of the French language and/or of the cultures and literatures of the French-speaking world. scholarships are awarded only to students in French; applicants are not competing with students in ESL, Classics, Linguistics, Bilingual Education, Philosophy, ASL, Spanish, German, Chinese, etc. Summer-session scholarship to attend the American University of Paris. Summer-session scholarship to attend the Institute for American Universities in Aix-en-Provence. Summer-session scholarship to attend the University of Québec at Chicoutimi. All of the above awards include housing, half board, and a Pi Delta Phi Travel Grant.